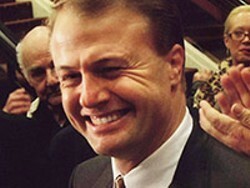 Washington state Attorney General Bob Ferguson says that conservative initiative mogul Tim Eyman "significantly hindered and essentially stalled" a money laundering probe. Now Ferguson is asking courts to compel Eyman to fork over tax and banking records. The Washington State Supreme Court has upheld a law that allows authorities to hold a mentally ill person in a psychiatric facility if they are found likely to commit another crime or if they were determined to be incompetent to stand trial and efforts to treat them are unsuccessful. Centennial Properties Inc., a company owned by the Cowles family, has purchased the downtown Macy's building with plans to transform it into a mix of offices and residential properties. Topping off a big week for the Spokane Tribe, U.S. Interior Secretary Sally Jewell paid them a visit to talk about their development goals. A federal appeals court upheld a California law that placed restrictions on concealed carry permits. The ruling found that the U.S. Constitution's Second Amendment does not grant citizens the right to walk around strapped. A funeral was held for boxer Muhammad Ali in his hometown of Louisville, Kentucky.